It has only been in the last few years, that I have begun to consider myself an “artist”. I was always creative and crafty but was not great at drawing. Because of that, I felt I could not be an artist. I had done all kinds of needle art – knitting, crocheting, and felting and was an avid gardener. In my early 50’s, I began my adventure with mosaic art. It quickly became an obsession and as I have learned new techniques and opened myself up to my creative side, I have realized that I am an artist. I paint with glass and with all types of other tesserae. My subjects tend to come from my other passions – gardening and animals. Because I am a garden lover and animal lover, most of my art incorporates flowers, nature, birds, or animals. Attempting to recreate the beauty of God’s creation gives me great joy. 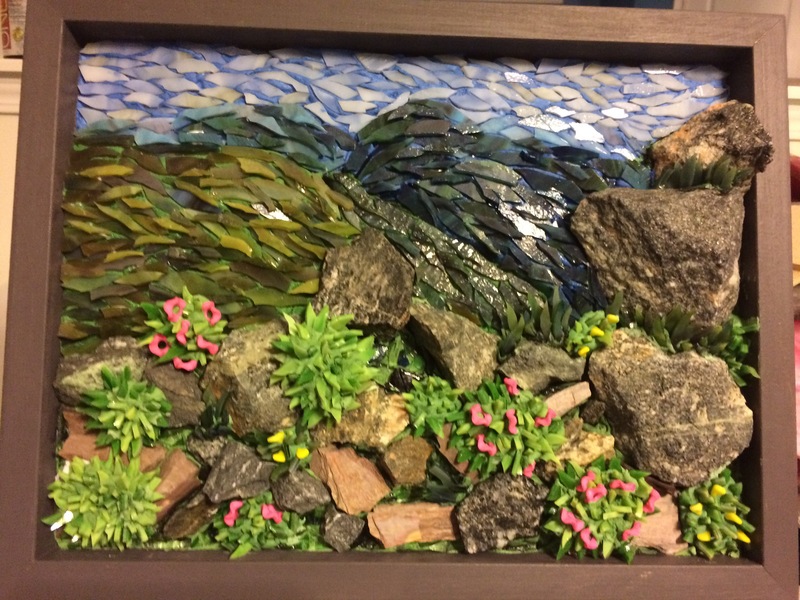 The joy of mosaics is creating something beautiful and different out of items that are often broken and discarded. It is a great metaphor on life. Once you become a mosaic artist, you begin to look at the world differently. Everything I see, I either think about making an art piece to represent that object or I think it would be cool to incorporate it into my art. I have taken several classes that have helped me to develop new and different skills in mosaics. 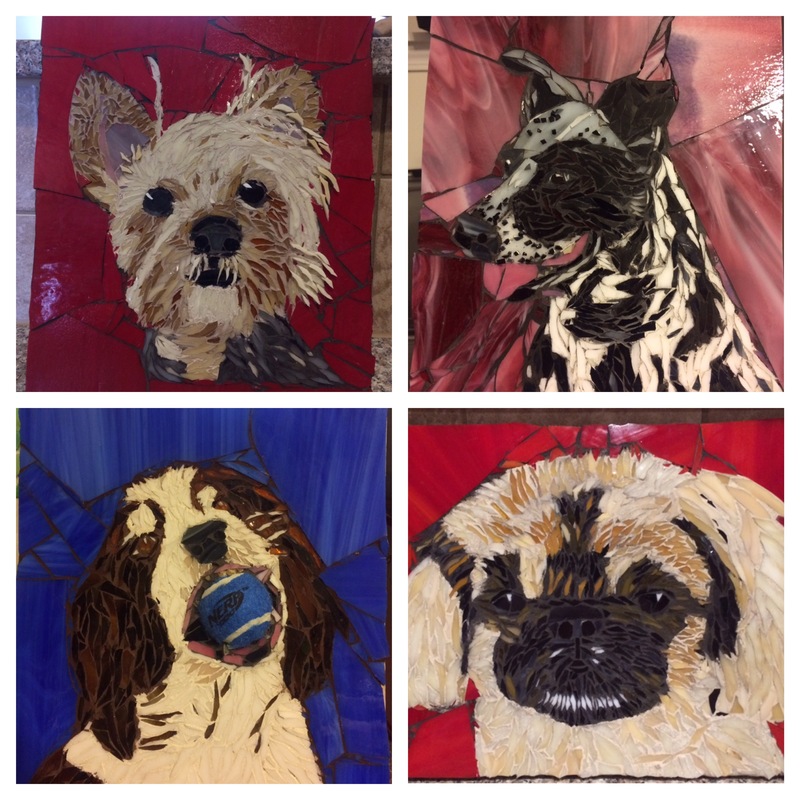 I took a class with Yulia Hanansen in Mosaic Pet Portraits and the Art of Painting with Glass. This class totally changed my approach to mosaics. Pet portraits continue to be my favorite projects to do. Capturing not just a semblance of the animal but their true essence gives me such joy. I love working with the owner to be sure that we have really created a portrait that gives them joy when they look at it. Another change to my mosaic art came after taking a class from Laura Rendlen. Laura opened my eyes to the possibility of making my mosaics 3D. I have begun to incorporate different types of tesserae into my work to give it texture and dimension. Creating landscapes and garden pieces in a 3D format allows me to incorporate so many different types of things into my work. I love using shells, rocks, bottle caps, beads, wire, hardware, whatever sparks my creativity. As I have progressed in my own artistic journey, I have developed a passion for teaching others to develop their creative, artistic side. I love teaching Beginner mosaic classes and seeing their faces light up when they see the beautiful piece that they have created. Each person in my classes creates a different piece. I work with them before class to help them to determine what they would like to use as their subject and then the colors and embellishments that they want to use to bring their subject to life. It makes the class a little hectic at first but is well worth it in the end when they see what they have created. When we are finished, they start the journey of thinking of themselves as artists too. I am very thankful to have this opportunity of time and energy to devote to developing my artistic voice and spreading the love of art to other people.